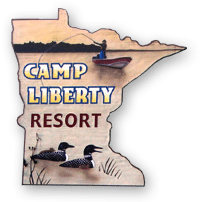 At Camp Liberty Resort we offer comfortable lakefront cabins on level park-like grounds with everything you will need for a fun and relaxing vacation. You will find our 10 cabins exceptionally clean, well maintained and fully equipped for housekeeping complete with microwaves and coffee makers. Each cabin has a large deck with picnic table, 2 deck chairs and a stationery charcoal BBQ grill. 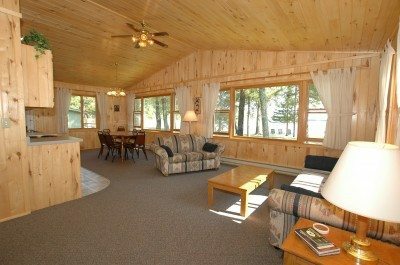 All cabins have knotty pine interiors, baths with showers and carpeted living rooms and bedrooms. We furnish bed linens, but ask you to bring your own bath & kitchen towels and soaps. Please refrain from smoking in cabins - you may do so on decks. A 14' aluminum fishing boat is furnished with each cabin. Life vests are available free of charge. Docking space is available for one boat, yours or ours. Additional boat docking is $60 a week. For your convenience in charging batteries, all docks have electrical outlets. An exceptionally clean and modern fish cleaning house and free freezer service is provided for your use. We stock minnows, wax worms, leeches & night crawlers in our bait house. Premium and mixed gasoline is also available. Rates are subject to Minnesota sales tax, local tax, and/or surcharge. In consideration of others and for the safety and enjoyment of all our guests, we do not allow PETS, JET SKIS, TENTS OR FIREWORKS. This applies to all guests and their visitors. Thank you! Click on each cabin to see detailed information, photos, and rates.